This time of year, I find it especially important to have a few quick and easy meals up my sleeve, especially for Mini Chef. When we get home and he’s starving, cooking dinner for the next two hours is simply not an option. I firmly believe in having a list pinned to the fridge of quick and easy dinners you can put together while you do other things. That way, when things get crazy busy, you don’t even have to think about what’s for dinner. You just head over to your list and pick one. Every parent (or busy person!) needs this list, and today I’m giving you one more option for that list. And this one comes with the added bonus of sneaking some veggies in where your kids will barely even notice. Mine sure didn’t! And if you really want to speed things up, you can grate the zucchini ahead of time. Either way, you’ll have a meal, a side dish or even lunch the next day prepared in the time it takes to cook a pot of rice. Serve with a side of rotisserie chicken you pick up on the way home for a complete meal! 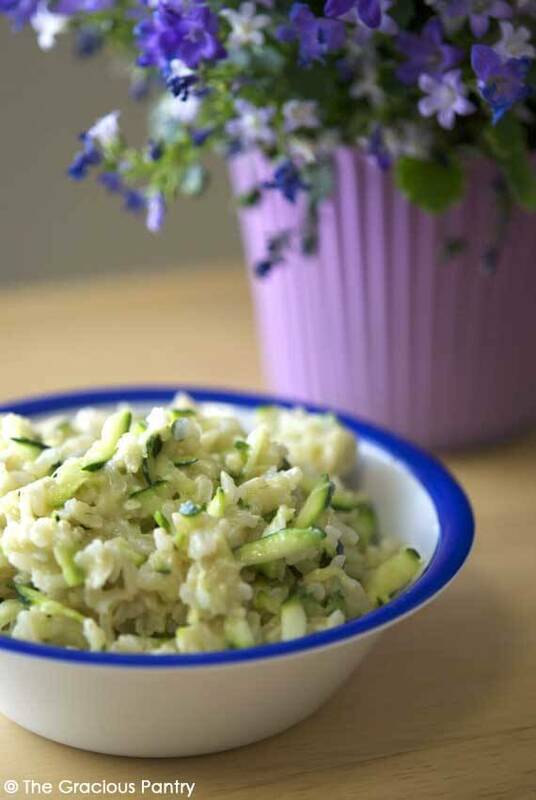 While the rice is cooking, grate the zucchini and measure out the parmesan. Once the rice is done cooking, immediately stir in the cheese and zucchini. Continue stirring until the cheese is melted from the heat of the rice. Stir in the garlic powder and salt if you need it. Notes on the cheese: The parmesan is completely adjustable to taste. Start with 1/2 a cup and stir in more as needed after adding all other ingredients. 1 cup makes it pretty cheesy. « Clean Eating Is Just Too Hard. I Can’t Stick With It. I give up! Yum! And so much better than anything you’d ever make from a box *cough cough, Rice-a-roni*.